Leverkusen started the match with just 5 of the players that started the 2-1 defeat to Freiburg in mid-week (Bernd Leno, Wendell, Sven Bender, Charles Aranguiz and Kevin Volland the only players to keep their place) and they ditched the 4-4-2 used in that game to instead switch to a more solid looking 4-2-3-1 with the talented Leon Bailey on one wing with Admir Mehmedi taking up position on the right flank. Lucas Alario was chosen to lead the line up front, with Volland playing behind him in the attacking midfield position. Hamburg went with the exact same formation and team that lost 3-0 to Borussia Dortmund, a 4-3-3 with Lewis Holtby deployed on the left wing, with Andre Hahn on the opposite side with Bobby Wood up-front. The midfield three of Walace, Gideon Jung and Sejad Salihovic would look to out-number the Leverkusen midfield duo if as expected Volland would play as an almost second striker. As expected, Volland for Leverkusen didn’t play as a typical attacking playmaker in the hole but instead looked to have a free role, swapping between pushing wide to support Bailey and Mehmedi and playing either just behind or alongside Lucas Alario up front. 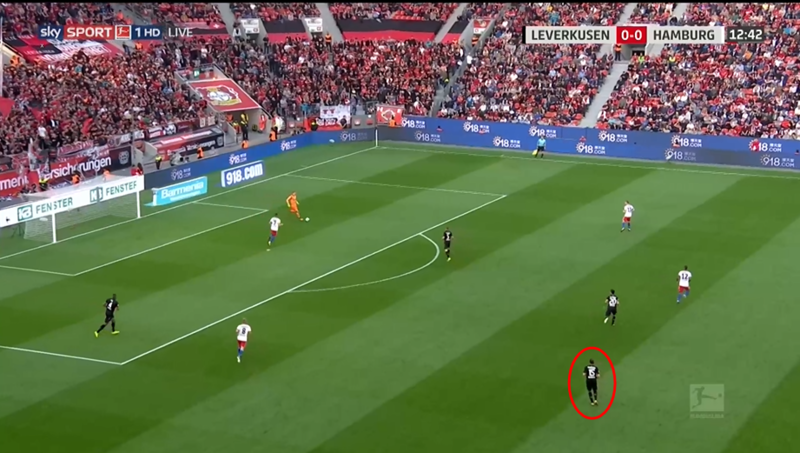 Hamburg had no answer to this and to me, it looked like their entire gameplan was to sit back to hopefully deny space in behind the defence for the pacey Bailey, Volland and Mehmedi to exploit. You can see via the picture above that Mehmedi (#14) has dropped deep to receive the ball – instead of Sakai or Holtby closing him down, Hamburg instead maintains their defensive shape with Holtby choosing to shuffle across the pitch rather than instantly close down the man. Whilst not a terrible idea on paper, cracks soon began to show – particularly when Hamburg won possession. Playing so deep meant that the Hamburg attack was often isolated and as such posed no real goal threat as seen below. 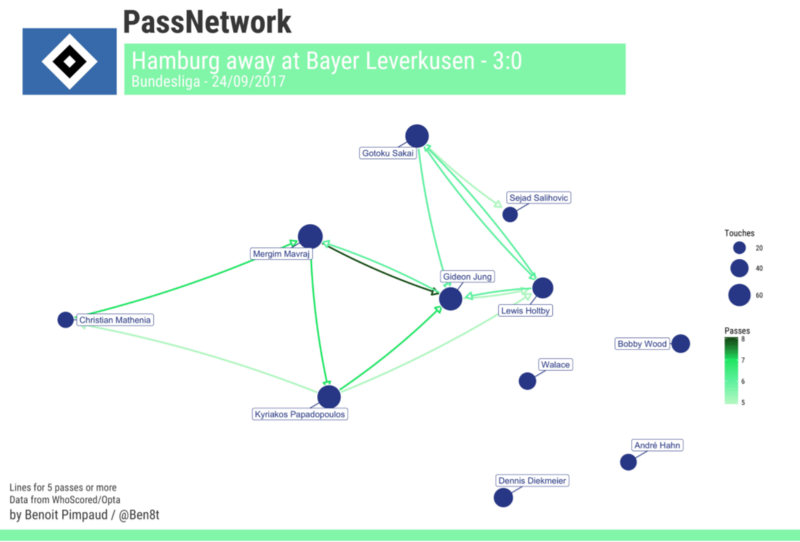 Whenever Hamburg won the ball, they didn’t try to keep possession, with aimless long-balls constantly hoofed up the pitch, looking at the Bundesliga stats for this season I can see that this is not specific to this particular game, with Hamburg having the 17th lowest amount of possession in the Bundesliga (with an average of 42.2% possession). The defensive game they were playing also soon began to unravel. Hamburg would sometimes switch to pressing higher up the pitch with their wingers and striker, but without the support from any midfield, it meant Leverkusen were easily able to play their way out from the back as seen below. The tight-knit defensive shape has vanished and now a potentially dangerous scenario has emerged with plenty of Hamburg players out of position – and plenty of Leverkusen players in space. Luckily for Hamburg, the chance didn’t amount to anything more than a Leverkusen throw-in, but the warning signs were there. All credit to Leverkusen though, whenever Hamburg won the ball, they chased it down in numbers to try to force the long-ball – where they’d be able to win the ball back with ease, as seen in the picture below where Mavraj inexplicably punts the ball long instead of playing the simple pass back to the goalkeeper. It’s therefore hardly surprising that Leverkusen went 1-0 up in the 25th minute with a nice finish from Volland. It was Leon Bailey that got the assist for Volland’s first goal of the game and the winger impressed me with a dazzling display. Just 2 minutes after setting up Volland, Bailey got himself another assist, this time in the form of an inch-perfect cross for Lucas Alario to prod home. Despite Hamburg’s defensive game-plan, he was a constant thorn in Hamburgs side with his dribbling prowess and incredible balance which created this fantastic chance below that really should have lead to another Leverkusen goal.